Was Moses Forecasting What Herzl Would Do With Modern State of Israel? - Breaking Israel News | Latest News. Biblical Perspective. Was Moses Forecasting What Herzl Would Do With Modern State of Israel? At the 120th anniversary celebration of the First Zionist Congress on Wednesday evening on Mount Herzl in Jerusalem, Prime Minister Netanyahu proclaimed, “Herzl is the modern-day Moses,” invoking the prophetic aspects of the State of Israel, namely, that the events in the Torah are a forecast of what will occur in the modern Jewish State. Theodor Herzl, born in 1860 in the Austrian Empire (now Budapest, Hungary) was the founder of political Zionism, the movement to establish a Jewish homeland. Herzl was a journalist and playwright before being influenced into political activism by the Dreyfus affair, a notorious anti-Semitic incident in which a Jewish French army captain was falsely convicted of spying for Germany. He thus formed the World Zionist Organization and founded the First Zionist Congress in Basel, which led to the future formation of the Jewish State of Israel. Franz Rosenzwag, a Jewish philosopher, saw Herzl as decisive proof of the historicity of the Biblical Moses. According to Dr. Shuki Friedman of the Israel Democracy Institute, whose areas of expertise include the relationship of religion and state and secular-religious relations, both men “established, ‘from the sand up’, a vision for the Jewish people and assembled them, from Egypt and the diaspora, into a community” – the Promised Land of Israel. Herzl was not unaware of his similarities to Moses, and neither was Prime Minister Netanyahu the first to point out their connection. “Herzl followed and was aware of the prophetic ideas of Moses,” Dr. Friedman said, noting that Herzl had planned on writing a five-part Biblical drama about Moses. Indeed, the connection between Moses, the legendary leader of the Israelites who received the Torah from Heaven, and Theodor Herzl, the modern founder of political Zionism and founder of the World Zionist Organization, is uncanny. While Moses heeded the divine call from God to lead the Jewish people into the Promised Land, Herzl’s belief that the Jewish people need a state in order to avoid anti-Semitism, express their culture freely, and practice religion without interference led to the establishment of the Jewish State and ingathering of exiles into the Promised Land. Both leaders began their leadership journey as outsiders to the Jewish story. Although Moses belonged to a Jewish family, he grew up in the palace of Pharaoh. Similarly, although Herzl was raised in a Jewish family, he was a secular Jew without ties to the Jewish community. According to Jewish Virtual Library, Herzl “was educated in the spirit of the German-Jewish Enlightenment, and learned to appreciate secular culture.” His Jewish identity only developed in his 20s as a writer in Paris. Although they were at first outsiders, both Moses and Herzl were driven by injustice they saw at the expense of the Jewish people. 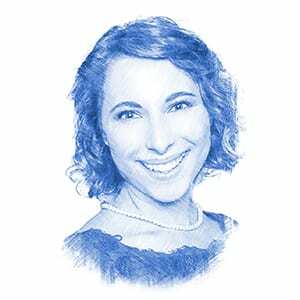 “Both Moses and Herzl became leaders after gaining an awareness of the suffering of the Jewish people,” Dr. Friedman told Breaking Israel News. While Moses was driven to impulsive action after seeing an Egyptian hitting a Jewish slave, the anti-Semitism Herzl witnessed in the Dreifus Affairs as well as the thought of Jews being unprotected without a national home led him to action. For both men, there was a “shaking experience that made them change their course of life,” and more importantly, the course of Jewish history. Although they were unlikely leaders, each rose to positions of authority to guide their people into the Promised Land. But before doing so, each faced resistance from their own people out of fear that a change in their situation could be a change for the worse. Fellow Jews tried to kill Moses to stop him from leading the Jewish people into new circumstances that might be worse than what they thought would be a short-term enslavement in Egypt. According to Dr. Friedman, during Herzl’s rise to leadership, he received a two-fold opposition. First, secular European Jews believed that national independence would risk the positive treatment they received in the countries that awarded them rights. Second, some Orthodox Jews rejected taking Jewish fate into their own hands by returning to the State of Israel before the arrival of the Messiah. In fact, the First Zionist Congress was supposed to be in Munich, Germany, a center of Jewish life, but because of Orthodox opposition, it was moved to Basel, Switzerland. Finally, each visionary died before his legacy and dreams were fulfilled, although Herzl understood the importance of the First Zionist Congress. “In Basel I founded the Jewish State,” he said in 1897, 51 years before Israel declared independence in 1948. At the event marking 120 years since the First Zionist Congress in Basel, thousands of Israelis, olim (immigrants), and youth groups from around the world gathered on Mount Herzl, his namesake. The World Zionist Organization, in conjunction with the Prime Minister’s Office, held the event to commemorate the gathering that established the foundations of the national struggle leading to the founding of the State of Israel. The celebration included elements the like of which Herzl could never have imagined, demonstrating nearly 70 years of Zionist culture, history and values. Dance performances, Israeli musicians Roni Dalumi and Idan Amedi, videos of Zionist organizations from all around the world, and personal stories of modern day Zionists were exhibited at the ceremony.